There are many different types of solder being used by industry. Solders are available in various forms that include bars, wires, ingots, and powders. Wire solders are available with or without a flux core. Because of the many types of solder available, this chapter only covers the solders most commonly used by Steelworkers. TIN-LEAD SOLDER. - The largest portion of all solders in use is solders of the tin-lead alloy group. They have good corrosion resistance and can be used for joining most metals. Their compatibility with soldering processes, cleaning, and most types of flux is excellent. In describing solders, it is the custom of industry to state the tin content first; for example, a 40/60 solder means to have 40% tin and 60% lead. Tin-lead alloy melting characteristics depend upon the ratio of tin to lead. The higher the tin content, the lower the melting temperature. Tin also increases the wetting ability and lowers the cracking potential of the solder. The behavior of tin-lead solder is shown by the diagram in figure 6-8. This diagram shows that 100% lead melts at 621°F and 100% tin melts at 450°F. Solders that contain 19.5% to 97.5% tin remain a solid until they exceed 360°F. The eutectic composition for tin-lead solder is about 63% tin and 37% lead. 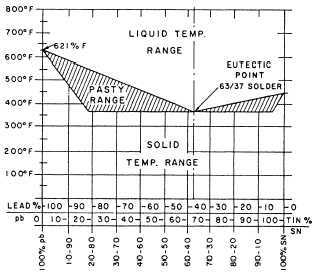 ("Eutectic" means the point in an alloy system that all the parts melt at the same temperature.) A 63/37 solder becomes completely liquid at 361°F. Other compositions do not. Instead, they remain in the pasty stage until the temperature increases to the melting point of the other alloy. For instance, 50/50 solder has a solid temperature of 361°F and a liquid temperature range of 417°F. The pasty temperature range is 56°F - the difference between the solid and the liquid. Solders with lower tin content are less expensive and primarily used for sheet metal products and other high-volume solder requirements. High tin solders are extensively used in electrical work. Solders with 60% tin or more are called fine solders and are used in instrument soldering where temperatures are critical. TIN-ANTIMONY-LEAD SOLDER. - Antimony is added to a tin-lead solder as a substitute for some of the tin. The antimony, up to 6%, increases the strength and mechanical properties of the solder. A word of caution, solders having a high antimony content should not be used on aluminum, zinc, or zinc-coated materials. They form an intermetallic compound of zinc and antimony that causes the solder to become very brittle. Figure 6-8. - Tin-lead alloy constitutional diagram. TIN-ZINC SOLDER. - Several tin-zinc solders have come into use for the joining of aluminum alloys. The 91/9 and 60/40 tin-zinc solders are for higher temperature ranges (above 300°F), and the 80/20 and 70/30 tin-zinc alloys are normally used as precoating solders. LEAD-SILVER SOLDER. - Lead-silver solders are useful where strength at moderately high temperatures is required. The reason lead by itself cannot be used is that it does not normally wet steel, cast iron, or copper and its alloys. Adding silver to lead results in alloys that more readily wet steel and copper. Flow characteristics for straight lead-silver solders are rather poor, and these solders are susceptible to humidity and corrosion during storage. The wetting and flow characteristics can be enhanced as well as an increased resistance to corrosion by introducing a tin content of 1%. TIN-ANTIMONY SOLDER. - Tin-antimony solders are used for refrigeration work or for joining copper to cast-iron joints. The most common one is the 95/5 solder.